The New York Jets are in the possession of more than one starting-caliber quarterback for the first time in a long time. Having said that, the Jets’ quarterback competition remains cloudy after two preseason games. But this much is clear, Jets quarterback Teddy Bridgewater is back to playing high-level football again. He is fresh off a two-year hiatus — the result of a brutal ACL tear — and has quickly become the center of trade talks after two impressive performances this preseason. Through two weeks of the preseason (yes, a small sample), Bridgewater looks like he’s well on his way to being the player he once was – a starting-caliber quarterback. He’s been impressive under pressure, staying calm and collected in the pocket, which aren’t exactly traits you would expect to see from a player coming off a traumatic knee injury. While you might say it is ‘only’ preseason, pressure is pressure. Over the last two contests, Bridgewater has connected on 8-of-9 throws when under pressure, including a touchdown and his lone incompletion was a drop. That calculates to a 140.3 passer rating under pressure. For perspective, the 2017 NFL average passer rating versus pressure was 64.5. Bridgewater has also been the sixth-most pressured quarterback of 36 qualifying signal-callers this preseason, so the strong numbers aren’t for a lack of reps.
NFL coaches surely see a lot of value in a quarterback that can make plays regardless of his offensive line’s success (or lack thereof). 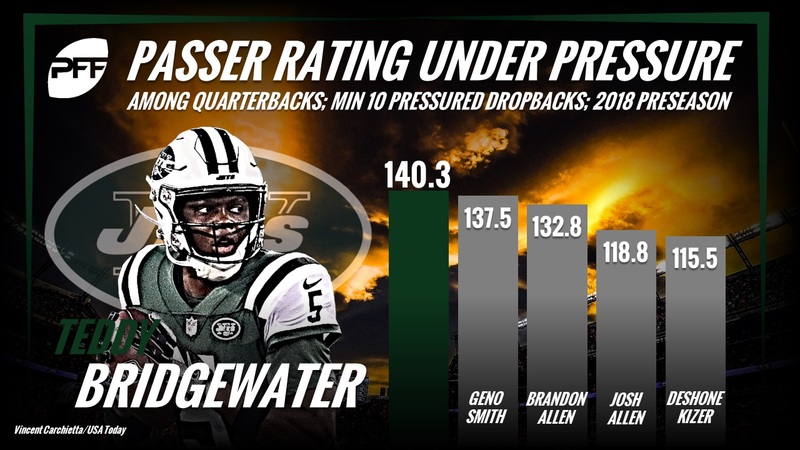 In Bridgewater’s case, he’s excelled both against the pressure and in getting the ball out quickly. 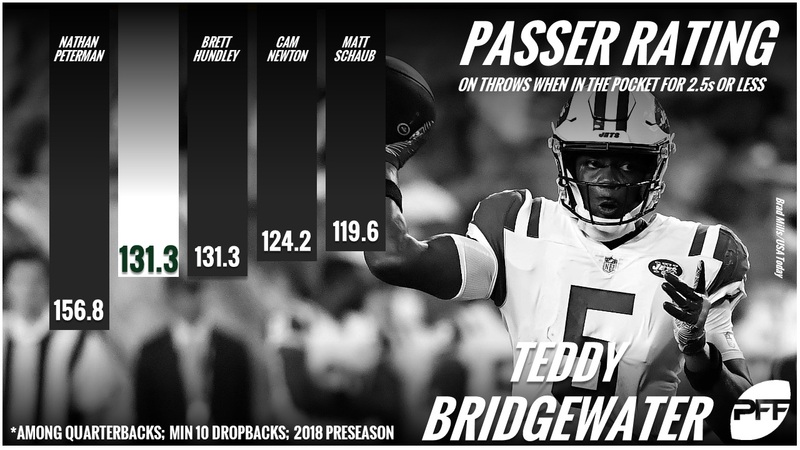 When throwing in 2.5 seconds or less, Bridgewater has posted a passer rating of 131.3, which ranks second among quarterbacks with 10 or more dropbacks this preseason. He also owns the fifth-highest completion percentage when throwing in 2.5 seconds or less among that same group of qualifying quarterbacks. While it’s still early, there is no denying Bridgewater’s value is on the rise. He has posted an 86.5 passing grade through two preseason contests, fourth-highest among qualifying quarterbacks. He has gone from an afterthought to the talk of the NFL, as he suddenly looks like a quarterback with the potential to help a team win some games. It’s difficult to speculate the price at which the Jets would be willing to let Bridgewater go, but if he continues to shine, the asking price will likely go up. After all, let’s not forget that Bridgewater is only 25 years old, which is younger than Jimmy Garoppolo, Derek Carr and Blake Bortles. In today’s NFL, anything is possible, so determining where Bridgewater will end up this season is a crapshoot. It will be interesting to see which teams will be knocking on the door looking for their quarterback of the future if the Jets opt to go with proven veteran Josh McCown or budding rookie Sam Darnold at the helm of their offense. But as it stands, two things are certain: Bridgewater is healthy, and the Jets have one of their best quarterback situations in years.